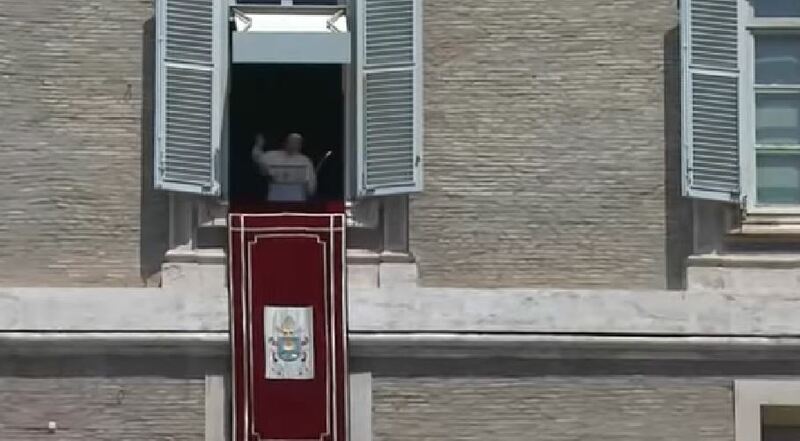 VATICAN CITY, JULY 15, 2018 (Zenit.org).- Here is a ZENIT translation of the address Pope Francis gave today, before and after praying the midday Angelus with those gathered in St. Peter’s Square. Today’s Gospel (Cf. Mark 6:7-13) recounts the moment in which Jesus sent the Twelve on mission. After having called them one by one by name, “to be with Him” (Mark 3:14), listening to His words and observing His healing gestures, now He calls them again “to send them out two by two” (6:7), to the villages where He was about to go. It’s a sort of “apprenticeship” for what they will be called to do, after the Lord’s Resurrection, with the power of the Holy Spirit. The evangelical passage pauses on the missionary’s style, which we can summarize in two points: the mission has a center; the mission has a face. The missionary disciple has first of all his center of reference, which is Jesus’ person. The account points it out using a series of verbs that have Him as subject – “He called to Himself,” “He began to send them,” “He gave them authority,” “He charged them,” “He said to them” (vv. 7.8.10) – so that the going and the labour of the Twelve seemed to radiate from a center, proposing again the presence and work of Jesus in their missionary action. This shows how the Apostles have nothing of their own to proclaim, or their own capacities to demonstrate, but they speak and act in as much as “sent,” in as much as messengers of Jesus. This evangelical episode applies also to us, and not only to priests but to all the baptized, called to witness, in the different environments of life, the Gospel of Christ. And for us also, this mission is only authentic if it begins from its immutable center, which is Jesus. It’s not an initiative of individual faithful or of groups and even less so of large aggregations, but it’s the mission of the Church, inseparably united to her Lord. No Christian proclaims the Gospel on “his own,” but is only sent by the Church, which has received the mandate from Christ Himself. It is Baptism, in fact, which makes us missionaries. A baptized person who doesn’t feel the need to proclaim the Gospel, to proclaim Jesus, isn’t a good Christian. The second characteristic of the missionary’s style is, so to speak, a face, which consists in the poverty of means. His equipment responds to a criterion of sobriety. In fact, the Twelve are given the order to “take nothing for their journey except a staff; no bread, no bag, no money in their belts” (v. 8). The Master wants them free and light, without supports and without favors, certain only of the love of Him who sends them, strong only from His word, which they go to proclaim. The staff and the sandals are the pilgrims’ supplies because such are the messengers of the Kingdom of God, not omnipotent managers; not immovable functionaries; not divas on tour. We think, for instance, of this Diocese of which I am Bishop. We think of some Saints of this Diocese of Rome: Saint Philip Neri, Saint Benedict Joseph Labre, Saint Alessio, Saint Ludovica Albertini, Saint Frances of Rome, Saint Gaspare Del Bufalo and so many others. They weren’t functionaries or entrepreneurs, but humble laborers of the Kingdom. They had this face. And to this “face” belongs also the way in which the message is received: in fact, it could happen that it’s not received or heard (Cf. v. 11). This, too, is poverty: the experience of failure. Jesus’ experience, who was rejected and crucified, prefigures the destiny of His messenger. And it’s only if we are united to Him, dead and risen, that we succeed in finding the courage of evangelization. May the Virgin Mary, first disciple and missionary of the Word of God, help us to take the message of the Gospel to the world, in humble and radiant exultance, beyond every rejection, incomprehension or tribulation. My heartfelt greeting to you all, Romans and pilgrims of Italy and of various parts of the world: the families, the parish groups, and the Associations. In particular, I greet the Sisters of the Most Precious Blood of Monza, the novices of the Daughters of Mary Help of Christians from different countries, and the Polish young people of the Diocese of Pelplin (Poland), taking part in a course of Spiritual Exercises at Assisi.